Refined in detail through three editions, the manual's outstanding features include: an explanation of keys and how to use them; the inclusion of keys designed to identify by order or family extant mammals of the world; special sections containing comments and suggestions on identification; information on working with map coordinates and global positioning receivers; coverage of the use of computer programs to get estimates of home-range size and characteristics; and ideas for locating reliable, authoritative literature on mammals. 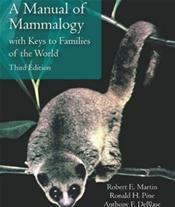 A section on techniques for studying mammals in the field and in the laboratory rounds out this student-friendly learning tool. Beautifully wrought illustrations and diagrams accurately portray visual details of mammal groups or characteristics that are unavailable to study in person. Moreover, well-designed laboratory exercises provide opportunities to apply knowledge and master understanding.